I am a newer weaver (5 years now) and I have been curious enough to try to duplicate the pattern and the fibers of your plaited twill scarves just by sleuthing. So far I have the 5/2 perle and a chenille. I am using 1450 YPP chenille. I found the pattern and tie-up in A Weaver’s Book of 8-Shaft patterns, p103. The one thing I cannot figure out is your sett. I’ve done a sett of 20, and I don’t know whether that is too close. And right now, I’m realizing about 6″ into the scarf that I’ve done something wrong–there are some float warp yarns that aremuch too long. I’ll trouble shoot it, but would you mind sharing your sett? I’ll go back and start again if I must, but I’d really appreciate your help/advice. Also, I wanted to mention that I loved seeing the headboard your husband had made. My husband and I are transplanted Oregonians (have lived in Maine for almost 23 years), and when I was in my early 20’s I worked in downtown Portland. The Real Mother Goose was always a treat to visit then (early 70’s). We still go to Oregon to visit family, and occasionally make the rounds to old favorites downtown…..
Hi Susan – I have it sett at 16 epi. Strickler p. 103 is correct (double two tie threading) so I can’t help you there. 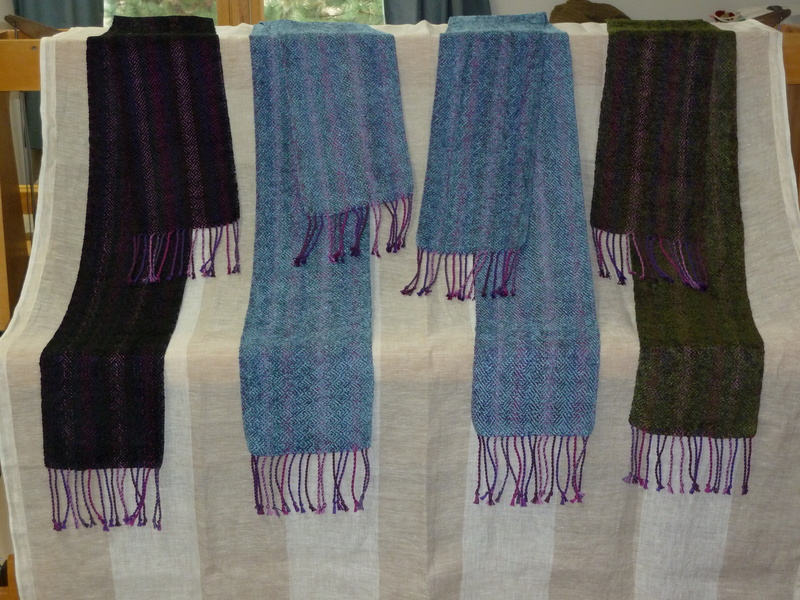 The first scarves I did were sett closer (maybe even 20) and they were very stiff off the loom, but actually fine after washing. But on the whole, I think I like the 16 epi better. I am using the same weight chenille you have (some from Webs, some from friends here). Thanks for your comment about Rick’s work and the Real Mother Goose! It is indeed a small world.